SACRAMENTO, Calif. (AP) Willie Cauley-Stein was very comfortable coming off the bench for the first time this season. Sacramento’s 7-foot center was just as happy playing out of position, too. Maybe coach Dave Joerger is onto something. 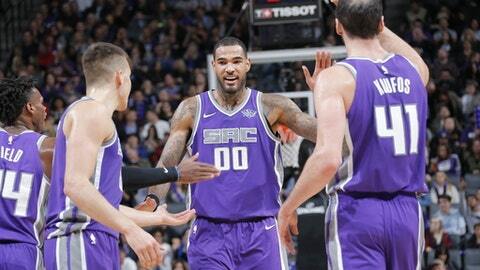 Cauley-Stein scored 13 of his 22 points in the fourth quarter while playing power forward in Joerger’s new-look lineup, and the Kings bounced back from an embarrassing loss earlier in the week to beat the Portland Trail Blazers 86-82 on Friday night. Cauley-Stein had started every game at center for Sacramento this season before Joerger shuffled his lineup and put veteran Zach Randolph in. That didn’t seem to bother Cauley-Stein, who came on strong at the end. He scored 10 of the Kings’ first 12 points in the fourth, including a pair of alley-oop dunks – the first coming when Frank Mason got tangled up and found Cauley-Stein cutting down the lane. Portland stayed close and pulled to 82-80 on a pair of free throws from C.J. McCollum, but De’Aaron Fox’s 3-pointer helped Sacramento hold on. The teams play again Saturday in Portland. George Hill and Garrett Temple added 14 points apiece, and Kosta Koufos had 10 points and seven rebounds to help the Kings to their third straight home win over a team with legitimate playoff hopes. Neither team managed more than 23 points in any of the first three quarters, and the Kings didn’t secure the victory until Cauley-Stein made one of two free throws with 3.4 seconds remaining. Damian Lillard had 29 points on 9-of-25 shooting and four assists but missed a 3-pointer in the final moments for Portland. McCollum added 19 points. Two days after losing by 46 points in Atlanta, the Kings held off the Blazers with one of their best defensive efforts of the season. Portland committed 18 turnovers and set a season low in scoring. The Kings led by eight early in the second before Lillard brought the Blazers back within 42-41 at halftime. Trail Blazers: McCollum made at least three 3-pointers in each of his previous six games – the longest streak of his career – but went 0 for 4 from beyond the arc against Sacramento. … Portland shot 34.6 percent (8 of 20) in the first quarter. Kings: Sacramento won for the second time in the last 10 games against Portland. . Buddy Hield limped off the court midway through the fourth with a sprained right ankle and did not return. … Vince Carter (kidney stone) remains sidelined. Trail Blazers: Head back to Portland to host Sacramento on Saturday. Kings: Play at Portland on Saturday.